ALL lodges participating in the Lodge Sponsorship Program at the Bronze ($500) or greater level have their lodge name listed on a banner at the float decorating site. Banners like these are suspended from the scaffolding surrounding our float during the week of decorating in December and are seen by many thousands of visitors, float workers and media representatives. THANK YOU ! Internet retailer Amazon (as well as the State of California and the IRS) recognizes our float as a charity and will donate 0.5% of any purchases to our float organization (aka Odd Fellows Past District Deputies Association of Los Angeles County) when you shop with Amazonsmile by following this link to smile.amazon.com. Prices, services and everything else about Amazonsmile is exactly the same as the regular Amazon site. A few pennies here and there from thousands of supporters will eventually add up to significantly help our float, so please ask your lodge members to remember to shop with Amazonsmile whenever they go shopping with Amazon. We encourage all components of all branches of the order to hold fund raising activities and participate in these opportunities to make your dollars count twice. Donations may be sent by mail or online. Lodge will receive Bronze Sponsorship Certificate. 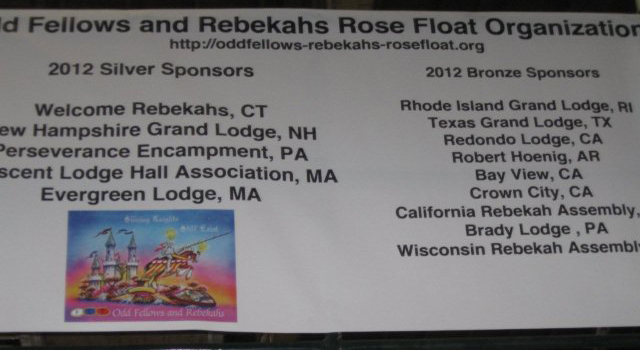 Lodge name listed on sponsorship banner placed in float work area. Lodge will receive Silver Sponsorship Certificate. Lodge will receive Gold Sponsorship Certificate. 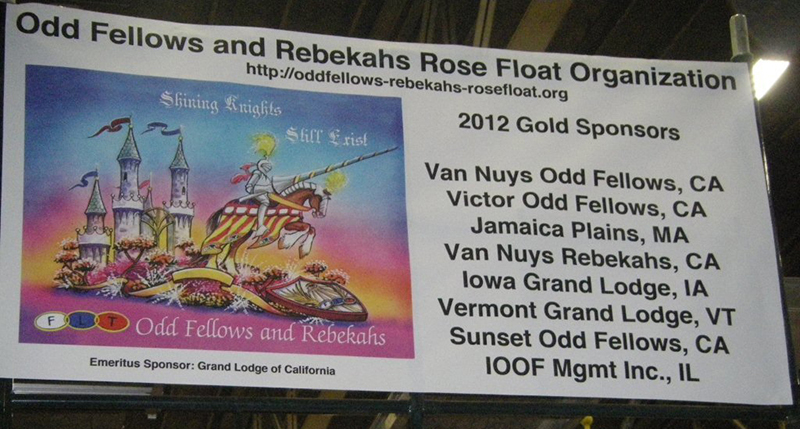 Opportunity to nominate a float rider if received early enough and if space is available. Two (2) IOOF-Rebekah passes to view float construction. 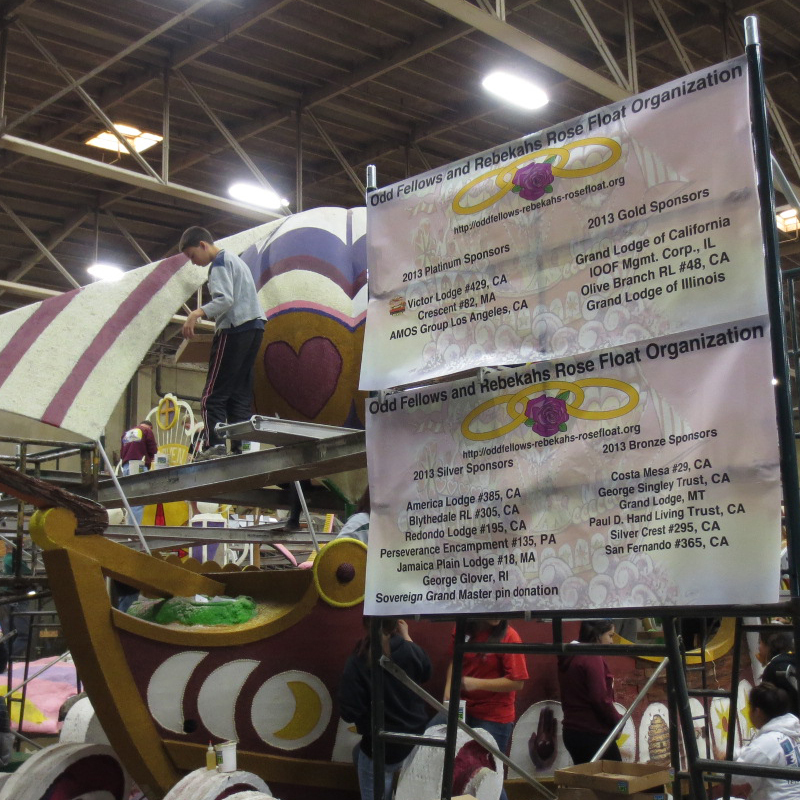 Two (2) Rose Parade tickets to the Pasadena Tournament of Roses Parade if received early enough. One (1) VIP Badge to attend float judging if received early enough. One (1) Rose Bowl football ticket if received early enough. Lodge will receive Platinum Sponsorship Certificate. Opportunity to designate a float rider if received early enough and if space is available. Two (2) VIP Badges to attend float judging if received early enough. Two (2) Rose Bowl football tickets if received early enough. Lodge name placed in the parade program as a Platinum level sponsor if received early enough.